The overall success and competitiveness of a company can be directly tied to the efficiency of its order management process. 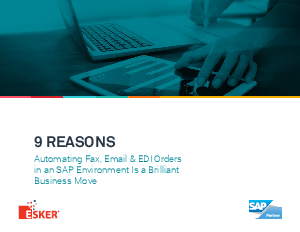 If you’re fed up with the low visibility, high costs, and inefficiency of fax, email and EDI order processing, here are 9 reasons why order processing automation in an SAP environment is a brilliant business move for your company. Learn more about Order Processing Automation — download the guidebook today!